You’re after an awesome video that captures the attention of your consumers. Your brand has something significant to say, and you want to make sure it’s said right. Your corporate client has come to your agency with a marketing budget that leaves a bit of wiggle room. Welcome to the glorious world of a good and fast production. This is the ideal choice if you can afford it. You’ve got the two best words in the triangle at your fingertips: it’s wise to be fast, it’s great to be good, but it’s not always preferable to be seen as cheap. But your video isn’t going to be cheap: it’s going to be good, and you’re gonna’ get it fast, and that’s good, right? 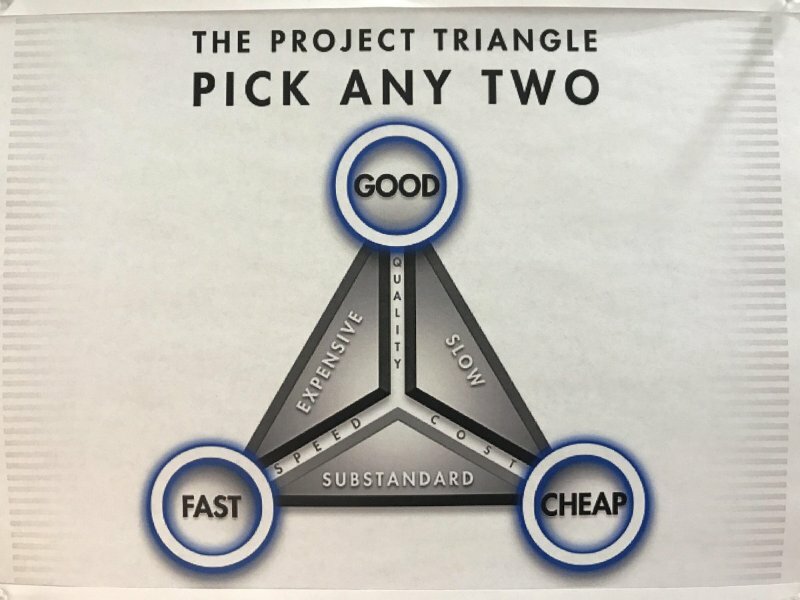 In the project management triangle ‘good’ is the holy grail. If you can afford a good brand video, then that’s almost certainly the route you should take, because who wants a bad one? No matter where on the spectrum of technology your target audience sits, good quality content reflects a professional brand, a competent brand, and a brand that can be trusted with the consumer’s money. In the business world we know time is of the essence. A poorly timed campaign can ruin the success of an otherwise great promotion. A synchronised campaign with missing video elements doesn’t really feel synchronised at all. Releasing your brand’s new video at the right time for your marketing needs is important, which is why a ‘fast’ production is always preferable where possible. Get ready to open your wallet, moneybags. Getting a rush-job on a project that maintains visual quality doesn’t come cheap. You’re paying animators and designers who must put aside existing work to make you their priority. And given the subjective nature of design work, different studios will work on different sliding scales of fees. It’s entirely up to you to research which production houses match your idea of ‘good’ and ‘fast’ relative to the amount they’re charging. Sometimes expensive isn’t better, sometimes it is. With the freedom of having an accommodating budget comes the extra work of researching where your money is best spent. So maybe the budget for this quarter needs to be stretched a little further than usual. Perhaps your B2B client has given your agency a hard dollar value to develop a campaign leaving you to squeeze every cent. You still want a top-quality video, but it’s more important for this project to watch your budget than your schedule. You’re diving head-first into the tenacious world of good and cheap production… eventually. A great quality brand video without breaking the bank? Score! If you’ve got the time to wait, this can be an excellent option for working within a strict budget. You get the benefits of a good video without appearing cheap. And in some ways, having a little more time up your sleeve can be great for coming up with creative ideas according to author Adam Grant, who expounds the virtues of purposeful procrastination. I hope you like waiting, because your ‘cheap’ dollar has bought you a spot at the back of the production line. Don’t get me wrong: you’re getting a good product… at some point. But everyone who’s paying the production house big bucks for a ‘fast’ video project will jump the queue, leaving you with either a video weeks, months, even years too late, or a project so disjointed by never-ending edits (because you’ve got the time, right?) that the ‘good’ simply becomes a mess of ‘meh’. This is the least desirable, but sometimes unavoidable, situation to be in. Content production is important for the image of any brand, and sometimes any brand video is better than no brand video. You’ve stumbled into the seedy underworld of cheap and fast production and maybe, just maybe, you’ll make it out alive. There is very little risk involved in a cheap and fast production. You go into the project expecting a certain lack of quality. In the best cases, you may be pleasantly surprised at how far a ‘cheap’ dollar will get you. After all, expensive doesn’t always equal good, and your idea of ‘fast’ might be perfectly acceptable to a high-output production house. In the worst case, the lack of quality makes the video campaign a total lost cause – but you’ve only lost a small investment of time and money anyway, so what’s the harm? Here’s the harm. A small investment of time and money is still an investment, and continually placing your money on a horse that’s designed to lose is a bad, bad betting strategy. Continual use of cheap, fast videos to represent your brand or clients doesn’t reflect to the consumer your frugality and time management skills, it reflects the exact level of quality they’re seeing. The budget of a few forgone cheap, fast videos pooled together can buy you a good, fast video, and the time you spend waiting on a good, cheap video can be spent researching how you’re going to market it. There’s no similar upside to a cheap, fast video. Whichever path you choose, keep in mind it’s not the only factor that goes into your video’s outcome. Promoting your brand video in effective ways, tracking the analytics of its performance, and deciding for yourself which factors actually determine ‘success’ for your brand campaign all play a much greater role than the simple choosing of good, cheap, or fast.